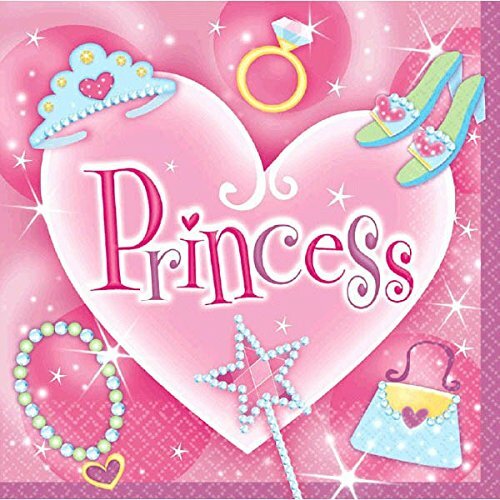 Features a pale pink heart with a “Princess headline against a pink background adorned with sparkling princess accessories. Perfect size to carry more food on your plate. Each plate measures 9” in diameter. Package includes 8) paper plates. 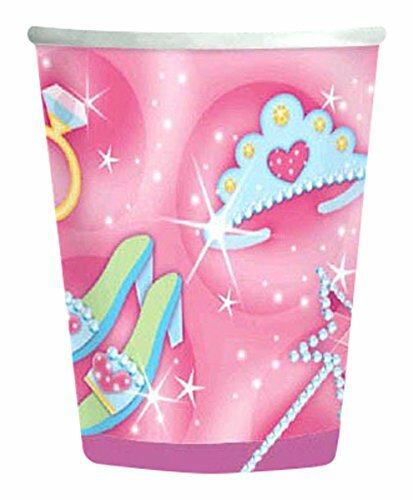 Perfect compliment to your Princess party. Package includes (16) durable 3-ply paper napkins. 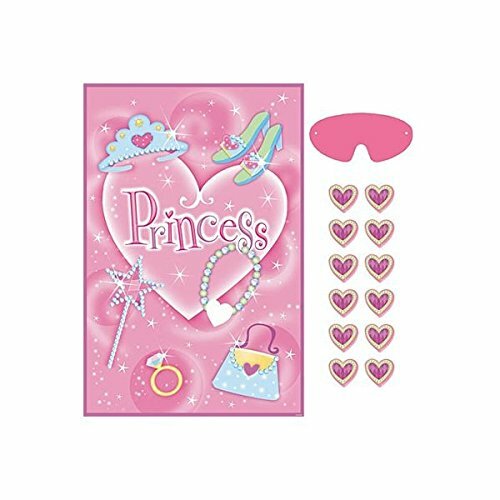 Features a pink background decorated with sparkling princess accessories: a star wand, a diamond ring, a tiara, a purse and a pair of glass slippers. Package includes (16) durable paper napkins. 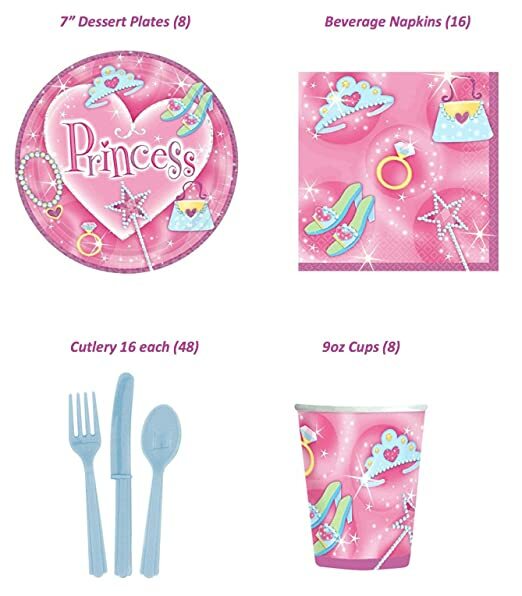 Features a pink background adorned with sparkling princess accessories: a star wand, a diamond ring, a tiara, a pearl necklace, a purse and a pair of glass slippers. Great for hot and cold drinks, desserts and even hot soup! Package includes (8) paper cups. Made out of plastic so that clean up is a breeze for the next round of guests. 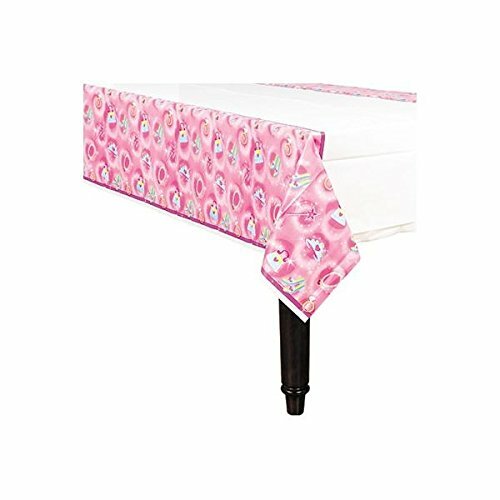 Package includes (1) table cover. 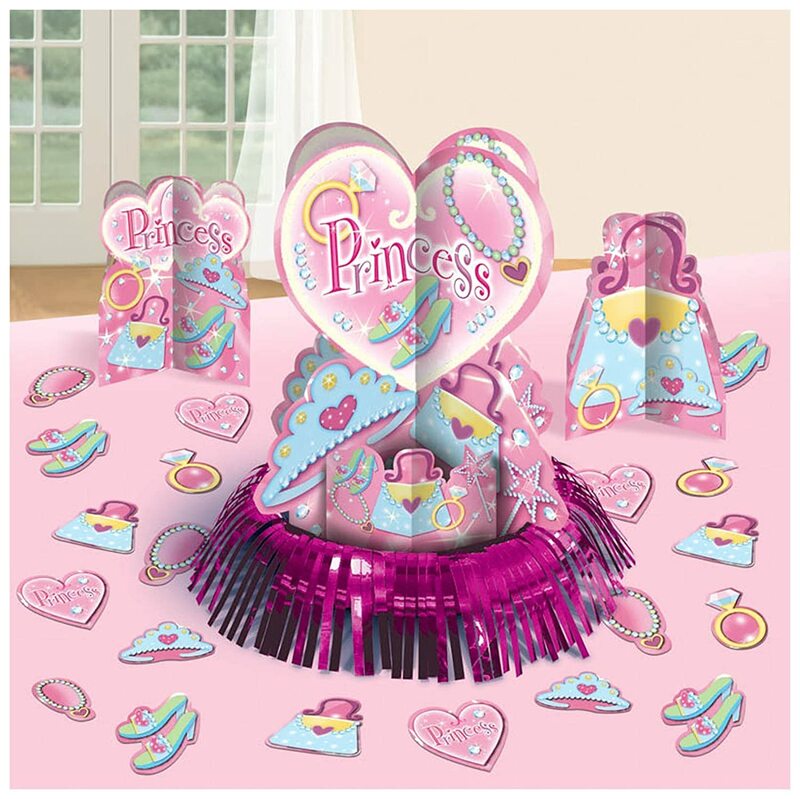 Features (3) Sparkling Pink Princess themed table centerpieces adorned with sparkling princess accessories such as star wands, diamond rings, tiaras, pearl necklaces, purses and glass slippers. Add more life to your plain table cloth by scattering 20 princess accessories cutouts on the table. Each cutout measures 2″. Very easy to set up and clean up. Feature metallic light pink, dark pink and teal swirls with various cutouts dangling from the bottom. 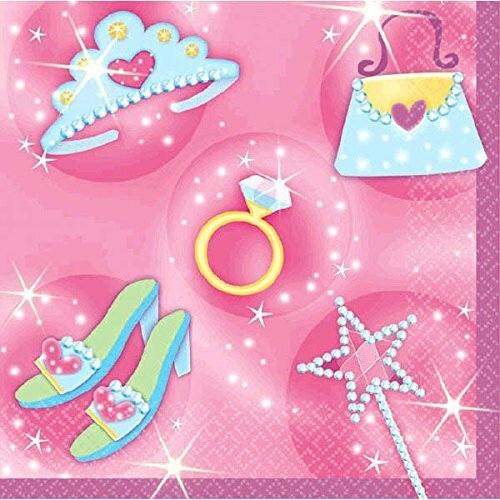 Cutouts display pretty princess symbols like tiaras, purses, high heels, jewelry and more in different shapes. Swirls are made from foil and cutouts are made from durable cardstock. 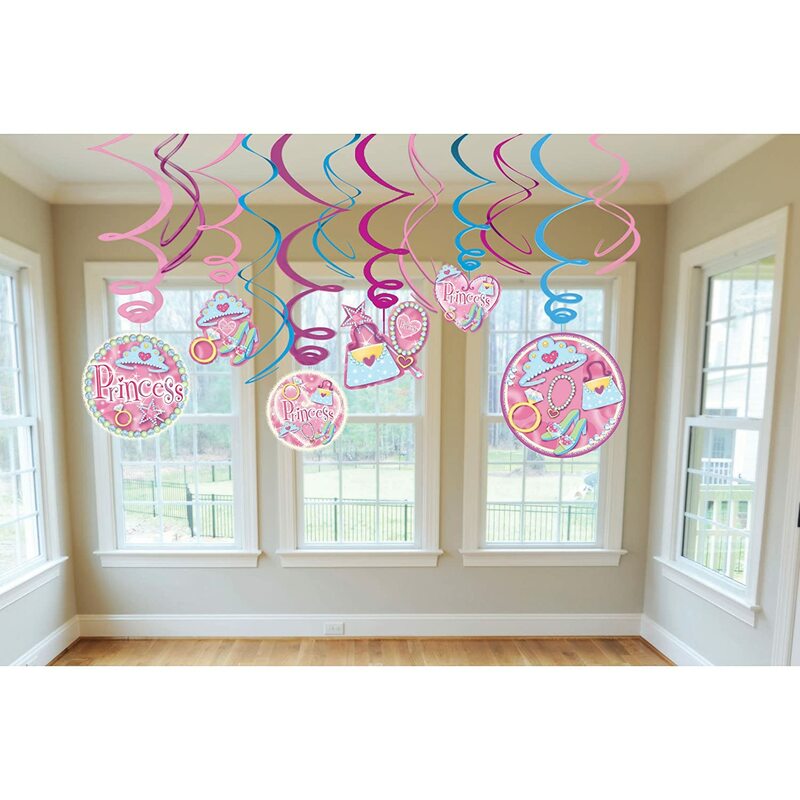 Package includes 12 Princess Swirl Decorations: 6 swirls with cutouts measuring 24″ long and 6 swirls with no cutouts measuring 18″ long. 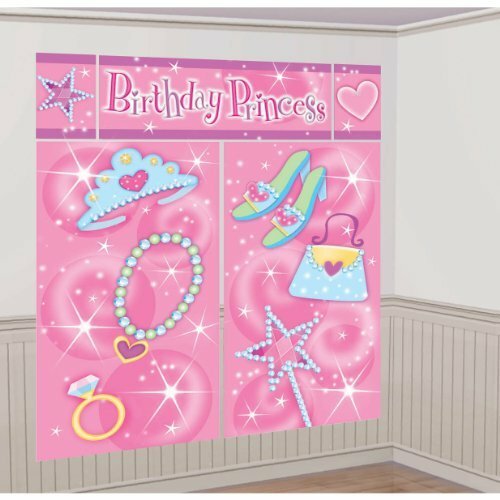 Features letter cutouts spelling “HAPPY BIRTHDAY”, decorated with sparkling princess accessories. Customize celebrant’s age by sticking the number stickers included onto the pink heart on the banner. Includes pink adhesive numbers and ordinal suffixes. Similar to Pin the Tail on the Donkey, the goal is to stick the heart charms onto the bracelet while blindfolded. Fun and entertaining for both the young and old. The game board poster serves as a great party decoration as well. 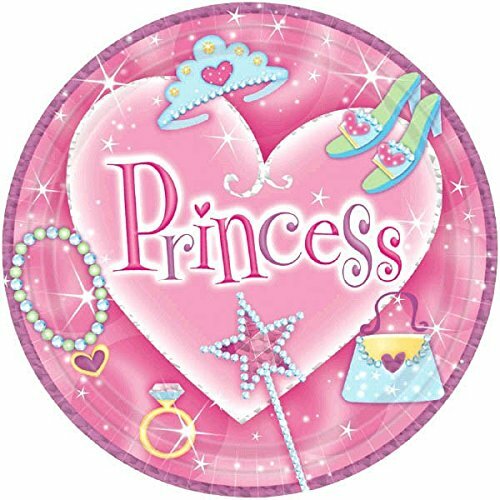 Features a confetti-filled medallion, with a “Princess” headline and a sparkling wand, purse, tiara. Medallion is fringed with pink ribbon pleats and 2 pink and white ribbon tails. 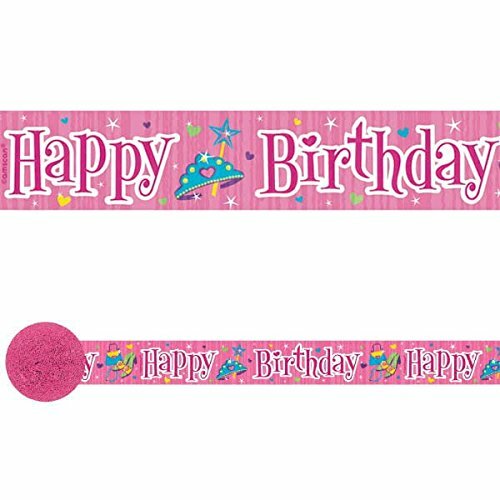 The perfect accessory to complete the birthday girl’s outfit or as a prize at party games. 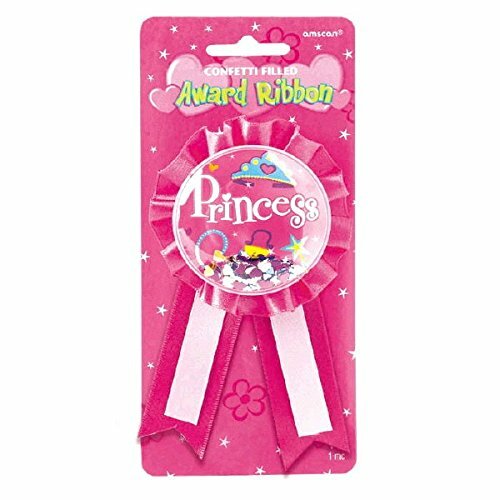 Package includes (1) award ribbon and measures 51/2″ long. Features a “This belongs to:” name area to write your guests’ names on. Each loot bag is made out of plastic and measures 9″ x 6 1/2″. 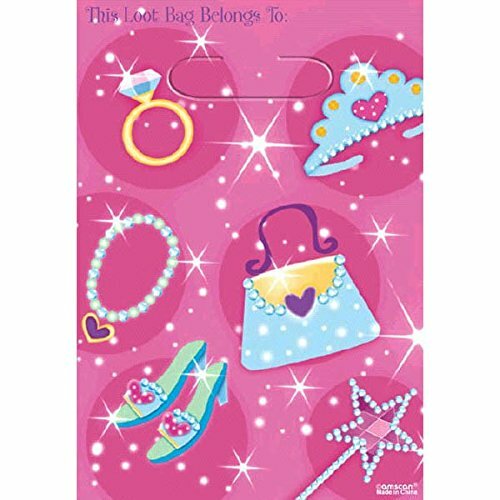 Package includes (8) Sparkling Pink Princess Loot Bags. 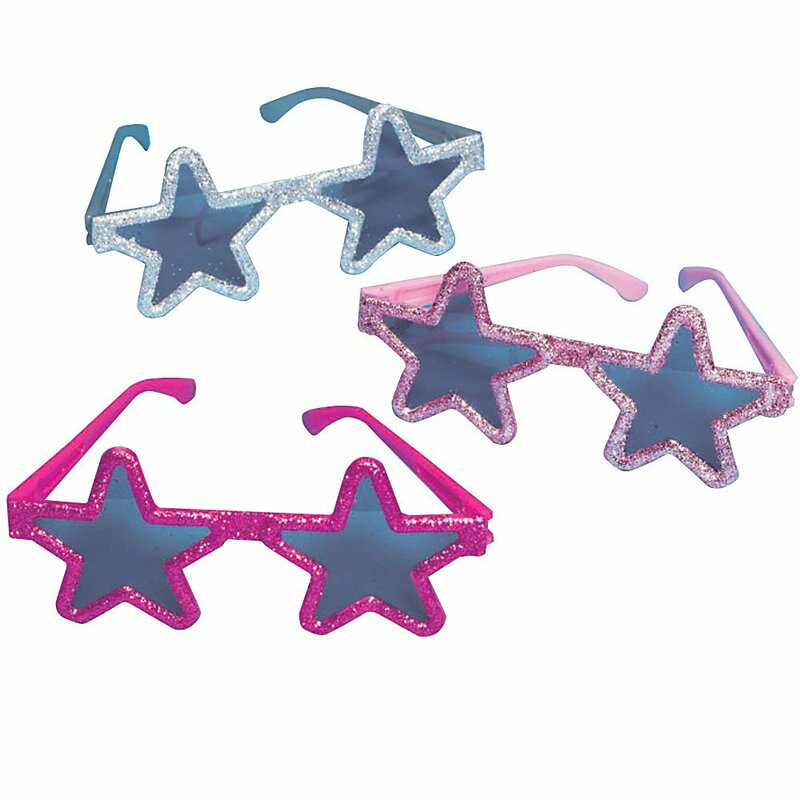 Features plastic star shaped glittered frames with tinted plastic lens. Available in 3 colors: hot pink, pink and light blue. Measures 5″ x 5″ x 2 1/8″. Each rubber bracelet has the word “Princess” printed on it. Comes in 4 assorted colors: white, baby pink, hot pink and purple. Each bracelet measures 2 1/2″ x 7/16″. 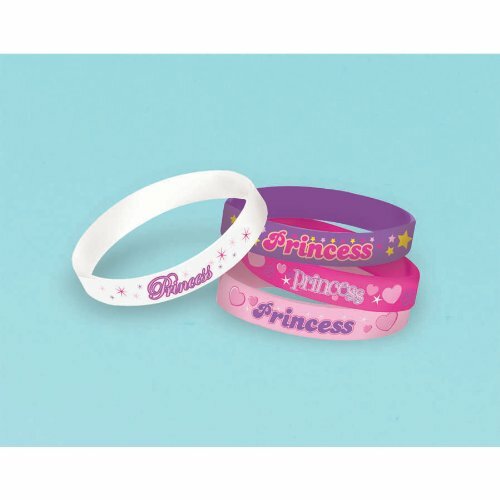 Package includes 4 princess rubber bracelets. 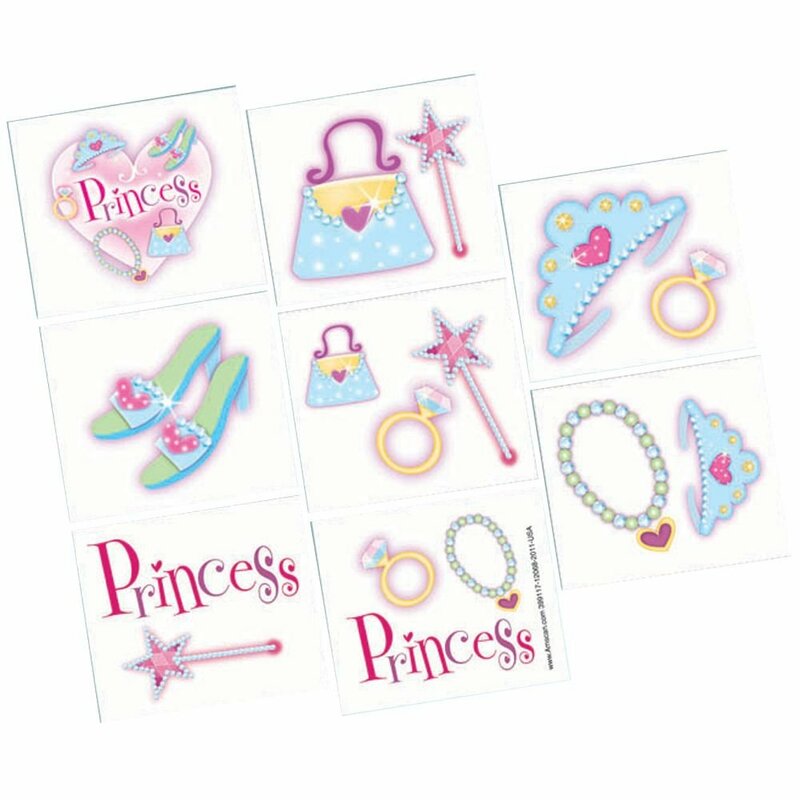 Features princess accessories such as glass slippers, purses, star wands, rings, necklaces, tiaras and “Princess” headlines. Made out of water permeable paper. Each temporary tattoo measures 2″ x 1 3/4″. Made out of printed crepe paper. 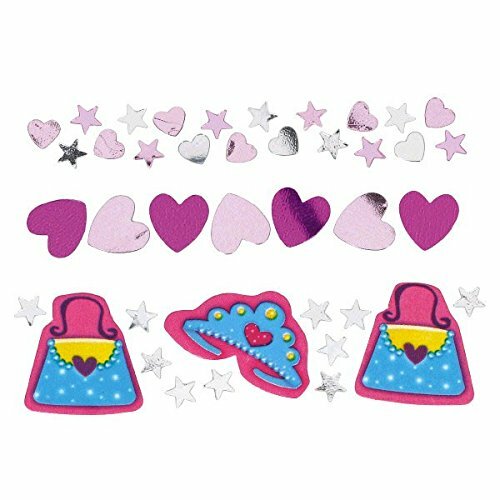 Features a pink background, colorful tiaras, heels, purses, wands and a “Happy Birthday” headline adored with mini stars and hearts. Drape streamers from windows, ceilings, walls, banisters or even furniture. Package includes one (1) 30 foot roll of crepe streamer. Contains a mix of foil stars and hearts and tiara and purse printed confetti. Confetti mix is composed of pale pink, hot pin, and blue colored confetti. Great for emphasizing a grand entrance and adding fun to the party. Package contains 1.2 oz of confetti mix. 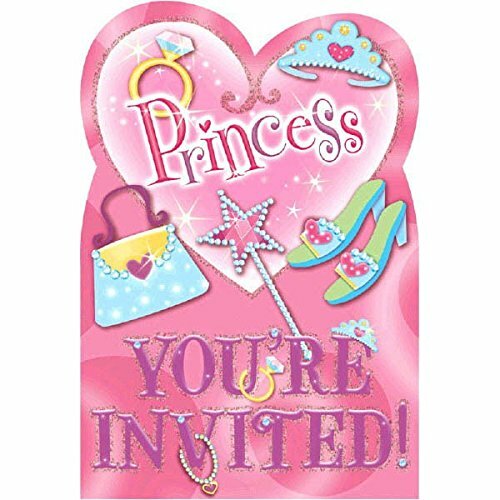 Cover features assorted princess accessories with “An Invitation” headline. Interior features lines to fill in with your specific party information. 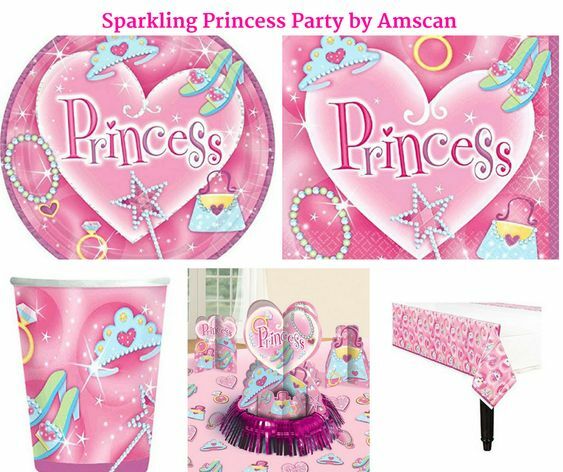 Perfectly compliments a princess theme party. Each package includes 8 sparkling invitations and envelopes.